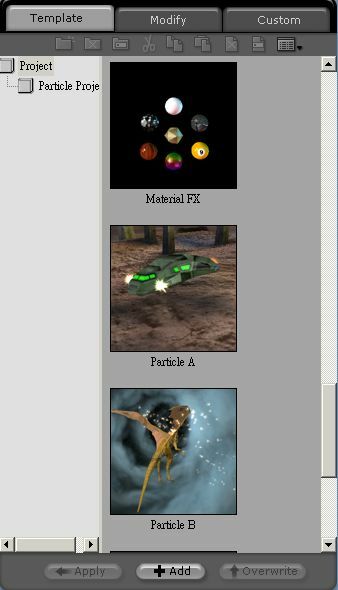 The file manager is contained in the panel on the right of the screen and is used for managing and adjusting the various iClone 3D files including models, animation and more contents associated with a project and the parameters associated with those contents. Please see Path for Design Assets and Projects for more details about the folders in which all files are stored. Contentsare displayed as tiles by default, but contentscan also be displayed as listed icons or thumbnails. Click the content display button to cycle through the contentsdisplay options. click the list category headers to sort the content by Name, Size or Date created for quick access to content selection. In most cases the file manager has three tabs, Template, Modify, and Custom. The Template tab contains all the predefined template contents. The Modify tab contains the various configurable parameters for the currently selected contents. 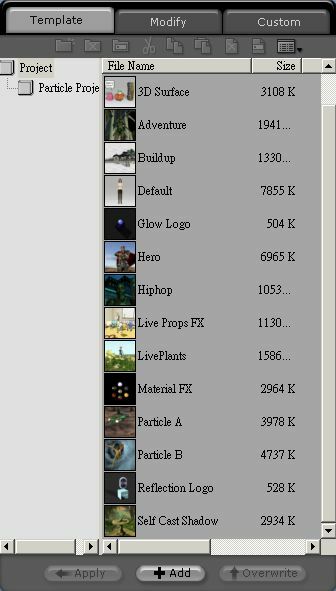 The Custom tab contains all the custom contentsyou have created with iClone and saved to the various Custom asset libraries. The file manager changes according to the current mode. For instance, if you click the project button to enter project mode, the file manager Template tab displays the project template files. Double-click a project template to apply it. The Modify tab contains parameters for changing the current project. 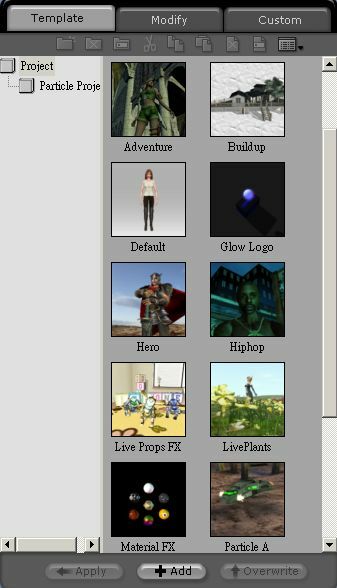 The Custom tab contains all the projects that you have previously saved. Apply: Apply the selected content to the current scene, the same action as double-clicking the content thumbnail. Add: Add the current editing content to the Custom tab for later use in any iClone project. Overwrite: select an item then click Overwrite button to replace the selected one with the content from the current project. Only contents in the Custom tab can be over-written.